Initial Certification Archives - RFCE - Resources for Continuing Education, Inc. NOTE: Students arriving 15 or more minutes late will NOT be admitted via new vendor provisions enacted by DSS. Classes begin at 8 am!! 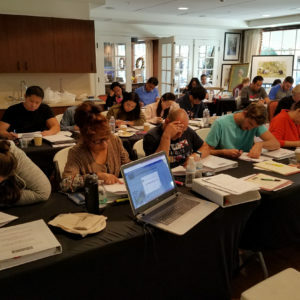 The 80-hour initial administrator certification course covers all subjects required by state laws and regulations for an individual to become a certified residential care facility for the elderly (RCFE) administrator. All classes are subject to availability and prepayment guarantees space. If one or more days cannot be attended, then arrangements can and must be made to make up the missed day or days at another location. However, if the dates of attendance are over 30 days apart, and Title 22/Health and Safety Code was updated, a nominal charge may be required to obtain the recent laws and regulations. The 80-hour class involves attendance of six, 10-hour days at a live course, and completing 20 hours of “online” or emailed materials.